With the new year, comes the initiation of the proposed 5 year plan the board adopted for our 30 acre park in Timberwood Park. While it is a working document, the proposed document covers a great many new additions and improvements to our 30 acre park including the potential expenditure in the next couple of years of approximately $1 Million dollars to build a second, new clubhouse in our park. The discussion at the annual meeting indicated the current/old clubhouse could be turned into a children’s center and/or fitness center and a new state of the art facility would be constructed. The reference used at the annual meeting presentation by the board was that our park could look something like “The Dominion” with a state of the art facility in addition to the existing facility. Please be sure to read the plan which you can find posted on the www.timberwoodparksa.org web site under the “local news” tab and provide comment back to Spectrum and/or the board regarding your thoughts about the proposed plan. To reach the board timberwoodnews@gmail.com and Spectrum is contact@spectrumam.com. The plan details a great many projects to expand/upgrade the park. Now that we have access to all our assessment dollars available for property owner use, we have a large amount of funds to accomplish much of what is being planned. Part of the comment process should include whether you believe the upgrades and improvements are necessary, good stewardship and in the best interest of you as a property owner. Whether you agree with the plan in its entirety or only parts of it, comment provides a view from the property owners perspective. Is there enough money (reserve fund) being saved for emergency situations that may or may not be covered by insurance? Does the average Timberwood Park property owner want the park to become potentially “over improved” or like “The Dominion”? With improvements will come additional overhead and expense to operate same. Have there been enough monies set aside for say a leak in the Olympic sized pool or the kiddie pool? Would those expensive repairs be covered by insurance or would we need reserve funds for such expenses? The board is indicating all the proposed amenities and improvements can be achieved without raising assessment fees, perhaps a better choice or a choice the property owners would like to see might be returning a small portion of the current assessment fees (a rebate or lowering of the annual assessment) as a gesture toward the fact we have more than enough money to operate the amenities we currently enjoy while adding a few of the suggested changes a little at a time. It’s up to you. It’s your money! Providing no comment means the proposed plans move forward. Please use your voice to provide feedback to the board regarding this important plan for the future of our park! 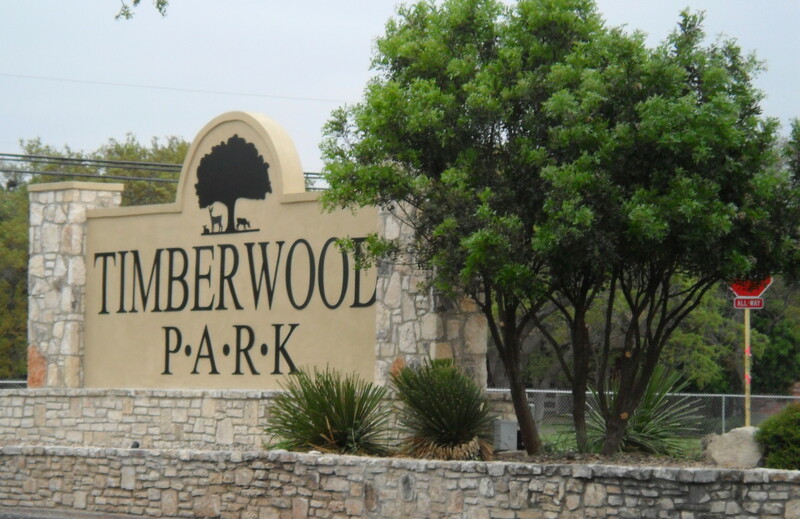 Next HOA meeting will be February 4, 2014 at 7 pm in the Timberwood Park Clubhouse. Please plan to attend and give your input to the many projects planned and already underway in our park. Everyone wants to get rid of the accumulated brush and debris on their properties. Brush and bulk waste drop off will occur February 22, 2014 from 9 am to 1 pm at the park. Mark your calendars and participate in this free event to Timberwood Park residents. The US 281 Community Advisory Committee (CAC) met last summer with the final minutes being released recently. Continuing work on that committee will be taking place this spring. As the next meeting is scheduled and information becomes available I will get it out to you. Information from the last meeting appears on the “local news” tab of the www.timberwoodparksa.org website. The EIS process is nearly complete and choices will be finalized for the 281 expansion decision. As soon as there is new detail is available, I will post it here! Know someone who need assistance preparing their taxes this year? This information is for you or someone you know needing assistance and is regardless of age or income! One of our property owners is volunteering with AARP to provide free tax preparation service to the community at-large by assisting in the free preparation of tax returns for anyone (not just those 50 and over!)! Free Income Tax Preparation and Electronic Filing will be available at the Bulverde/Spring Branch Library. The AARP Tax-Aide Program serves over 2,000,000 taxpayers, nationwide, thanks to over 32,000 IRS Certified Volunteer Tax Counselors. You do not have to be a member of AARP or a Senior to use this service. However, preference given to those over 60. There are no income limits. Call (830)885-2247 now for your appointment as available appointments go fast!